Ok so if you guys have never heard or seen Skindinavia then you are missing out I have been wanting for so long to try the *Skindinavia Makeup Setting Spray for so long I don't even remember, but I'm pretty sure it's been for years. 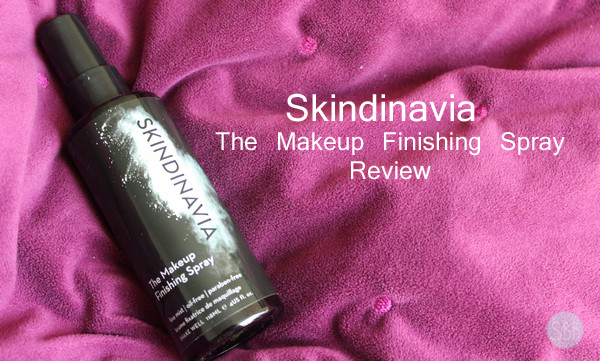 First I will talk a little bit about Skindinavia for those who don't know the brand. Skindinavia is a makeup prep and finishing cosmetics line. They sell products to prep your skin as well to set your makeup. They have a spcial technology in the setting spray that keeps makeup looking fresh for up to 16 hours. Read more here. I have been using this setting spray for maybe about a month now and I have to say I'm truly impressed. I have in the past tried 3 other spray out of the 3 I like 2. But this one I have to say it's almost like Ben Nye and Urban Decay mixed together in one. It makes my makeup truly last all day long. Of course by the end of the day I don't like like a just applied my makeup but by the end of the day I still look good. I notice a difference when I don't use this to when I do. When I don't wear this it all my makeup that is applied to my face is bascially gone not including concealer. When I do use this I can still see my contour, my highlight and a bit of my blush. What really surprised me was that I could still see my blush by the end of the day. It wasn't as nice as it was when I just applied it but by the end of the day you could still see that I had blush on. Which made this a winner for me. I also like how it's lightweight and helps to control my oil even thought this is not the oil control version. Overall this is a win in my book and I'm truly happy I got to try this out, if I could say once thing "bad" is that I wish it came in a bigger size. Have you tried this setting spray before?